Kirkpatrick Realty, LLC is located in Ellijay, Gilmer County, Georgia, nestled in the beautiful North Georgia mountains approximately one hour north of the Atlanta metro area. Gilmer County is not only one of the fastest growing counties in northern Georgia, but also one of the most scenic. Gilmer County, nestled in the foothills of the Appalachian Mountains, has over 300 miles of trout streams and 3 whitewater rivers that converge to form the 3,500 acre Carters Lake. 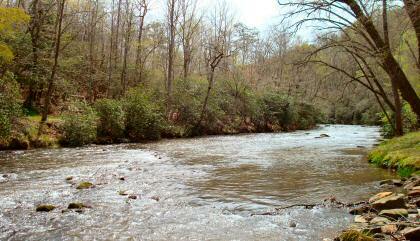 These waterways provide excellent opportunities for fishing, canoeing, kayaking, and rafting. The wildlife management areas of Rich Mountain, Coosawattee, Blue Ridge, and Cohutta Wilderness also provide numerous opportunities for hikers and hunters to enjoy the unspoiled beauty of the mountains with its abundant wildlife. With the beginning of the Appalachian Trail just minutes away, there are unlimited choices. Gilmer County is also home to Whitepath Golf Course which is an 18 hole public course with breathtaking mountain views. So no matter what your interests are, Gilmer County has it all. As a smaller specialty real estate company, Kirkpatrick Realty, LLC can provide personalized service to our clients in all areas of real estate. We have extensive experience in commercial and industrial development, sales and financing, land development, as well as residential sales and rentals. We can help if you are in need of office space, apartments, or a single family home to rent. We also offer real estate consulting, buyer representation, environmental consulting, and are senior housing specialists. Through our memberships in the North Georgia Board of Realtors Multi-List Service (MLS) and Commercial Listing Services in Atlanta, we can provide you with a broad range of available properties. We can assist you in making a well-informed decision regardless of your real estate needs.